Pope Benedict XVI has said the suffering of Holocaust victims must never be denied as he visited the Yad Vashem Holocaust Memorial in Jerusalem. "May the names of these victims never perish. May their suffering never be denied, belittled or forgotten," he said in the midst of survivors. The pontiff began his trip to the Holy Land by saying in Tel Aviv that anti-Semitism was totally unacceptable. He also voiced support for the Palestinians' right to a homeland. The Pope's immediate, forceful and unequivocal condemnation of anti-Semitism in any form and in any part of the world will have pleased his Israeli hosts, the BBC's David Willey reports from Jerusalem. Flying in from Jordan, where he visited a mosque at the weekend, Benedict was greeted by Israeli leaders at Ben Gurion airport near Tel Aviv before being flown to Jerusalem by helicopter. Yad Vashem is a place of immense symbolic importance for Jews around the world and, within it, the Hall of Remembrance is one of the most emotion-laden places. The very fact of the Pope's visit here carries huge symbolic importance. His personal history and the long and tortuous history of relations between the Catholic Church and the Jews saw to that. One Holocaust survivor I spoke to, who was one of the six the Pope was going to shake the hand of, told me she had to think about whether she wanted to meet the man who as a teenager had been a Hitler Youth. But then she said yes, it was. His very presence here, she said, was a victory for Israel and against anti-Semitism. "Sadly, anti-Semitism continues to rear its ugly head in many parts of the world," he said as Prime Minister Benjamin Netanyahu and President Shimon Peres sat nearby. "This is totally unacceptable. Every effort must be made to combat anti-Semitism wherever it is found." 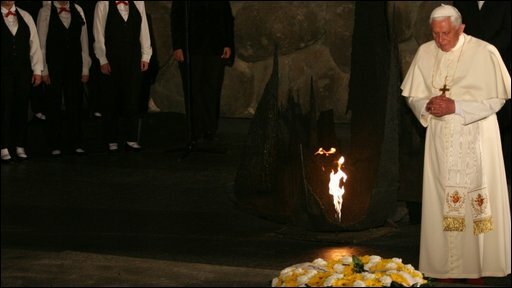 At the Yad Vashem memorial, where he was flanked by President Peres and other Israeli public figures, Pope Benedict laid a wreath on a stone covering the ashes of people killed in the Holocaust. He shook the hands of six Holocaust survivors before making a sombre speech about the six million Jews killed. "They lost their lives, but they will never lose their names," he said. "These are indelibly etched in the hearts of their loved ones, their surviving fellow prisoners and all those determined never to allow such an atrocity to disgrace mankind again." In his arrival speech, the Pope said the eyes of the world were upon the peoples of the Middle East as they struggled to solve conflicts that had caused so much suffering. He said: "I plead with all those responsible to explore every possible avenue in the search for a just resolution of the outstanding difficulties so that both people may live in peace in a homeland of their own within secure and internationally recognised borders." President Peres said he hoped the pontiff's visit would help "pave the road to peace". Prime Minister Netanyahu has now flown to Egypt, where the idea of a two-state solution will be high on the agenda in talks with President Hosni Mubarak. Israel's new prime minister has so far not said if he will support a two-state solution. Our correspondent, who is travelling with the Pope, says the Catholic Church and the current Israeli government do not see eye-to-eye on Palestinian statehood. He says the issue will be the main focus of talks between the Pope and the Israeli government over the next few days. Some embarrassment arose when the Pope attended an inter-faith meeting with Jews and Muslims after his visit to Yad Vashem. A Palestinian cleric, Taysir Tamimi, commandeered the microphone and gave an unscheduled speech attacking Israel's recent war in Gaza and its occupation of the West Bank. Some in the crowd applauded while others appeared visibly uncomfortable. The Pope was not seen to react. 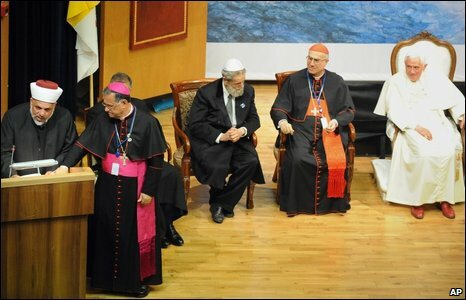 Oded Wiener, director general of Israel's Chief Rabbinate, said afterwards: "Sheikh Tamimi embarrassed the Pope." The Pope said Israel and the Vatican had many shared values, including the desire to put religion in its rightful place in society. Apart from celebrating Mass in Jerusalem and Nazareth, Pope Benedict will also visit the most sacred places in Jerusalem for Jews and Muslims. He will also visit a Palestinian refugee camp close to Bethlehem. Israel is beefing up security for the trip in an operation named "White Robe", with tens of thousands of law-enforcement officers deployed and entire sections of Jerusalem to be shut down. During the previous leg of his tour - a three-day stay in Jordan - the Pope stressed the importance of Christians and Muslims working together.